Just bought Voltage Modular and like it very much! However I have been unable to find a way to keep my automation assignments to MIDI controllers. When I change the preset, the automation assignment to performance knobs is lost. This is problematic with the DAW I use, Bitwig. There is no 'MIDI learn' as such in Bitwig, but everything functions via automation assignments. I would really like to be able to store one global set of automation knobs which are mapped to eight 'device macros' in Bitwig - and use that in every preset. Do you think this could be doable? I can overcome this problem with very tedious way: open each preset one at a time, assign all the performance knobs to Bitwig Macros and then store the preset. But the amount of work to do this is daunting! The performance knobs and buttons are global and should not be being cleared when you hit 'New' within Voltage Modular. Can you shoot a video of this and post it? Have you tried standalone? Let us know. Thank you for very fast reply, CG! Just changing presets, and also hitting the "New" clears the connection from MIDI controller/automation to "perform" knobs. For me it seems that automation is stored with the preset only. If you need a video, I can make it tomorrow. 1) Try MIDI learning the performance knobs with Standalone as a test. I tried standalone and it stores MIDI controller CC well, and keeps that info over preset changes OK. The problem is that in Bitwig (there is a time limited demo if you want to test), there is no MIDI learn! The controller binding with Voltage Modular is done via "Perform Automation Assign". And those assignments seem to be preset based (which is logical behaviour at least when knobs other than Perform are assigned) - What I am asking is a way to keep those 8/9 Perform knob automation assignments. In the video I play first preset "B" with two knobs assigned. OK - Then switch to preset "Kohina" and assignments disappears. In the end I try to MIDI learn, but as said, that is not available in Bitwig. Very odd. We will have to test this out and see if we can reproduce it in Bitwig. Thank you for the video. Using "MIDI Learn" to assign a MIDI CC number to a Performance knob DOES keep that mapping when changing Presets or in "New" modulars. But, using "DAW Automation" that mapping is not kept when changing Presets or in "New" modulars. (c) DAW Automation (mapping to plug-in parameters) for Performance knobs and module controls is saved in the Preset. (Disclaimer: I do not know much about Bitwig). -- could you use the MIDI CC Device to send MIDI CC messages to Voltage Modular, then automate that device's parameters? 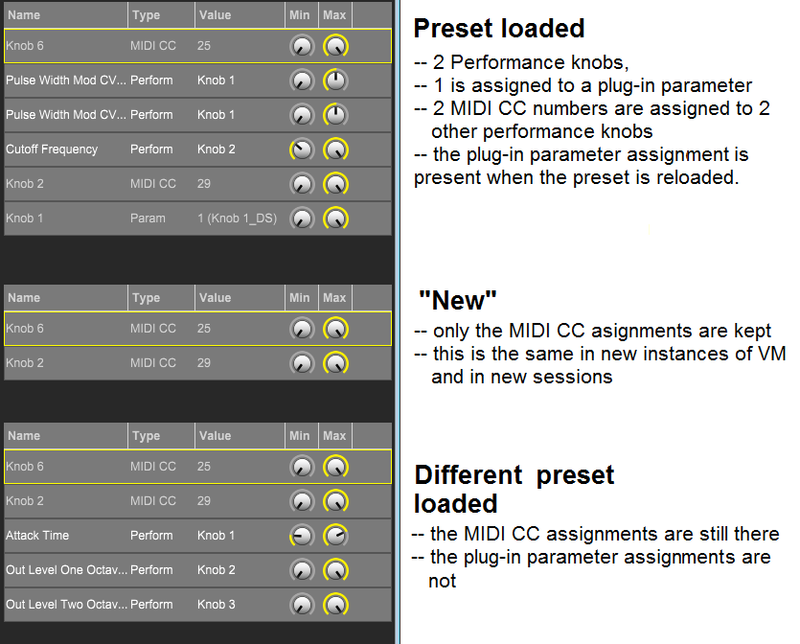 -- or put MIDI CC into a MIDI item? Declare the (16) Performance knobs and (8) buttons and Master Volume as plug-in parameters automatically, to avoid the users having to map them. (a) use parameter numbers 1-25 for them and use 26 onwards for the 128 assignable parameter slots. (b) or, if that breaks backwards compatibility, keep the 128 slots as at present and put the Performance knobs and buttons and Master Volume in parameter slots 129 onwards. Ok that makes sense. I will add this as a feature enhancement/bug. Thanks again for your help.